A four-year sport management degree for athletics programs and operations. This nationally-recognized, career-ready major integrates management skills and marketing concepts in sports, giving you the experience and expertise you need to join the third-largest industry in America. Professors who love to teach. 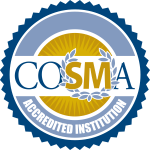 Thomas College will voluntarily withdraw from COSMA membership and relinquish its accreditation effective June 30, 2019.